A mad invasion of the Varied Thrush is now underway across the west. Where did these birds come from? We normally have a few around in the forested areas of the region, but now they are seemingly everywhere. And not just the odd singleton either – birders are seeing flocks of 30, 40, 50 or more birds at once. The Varied Thrush is a bird that will follow an irruptive migration pattern; some years the birds will concentrate in areas other than their normal wintering habitat. You’ll have to ask them why. It’s not only the Varied Thrush appearing in out of the ordinary quantities. 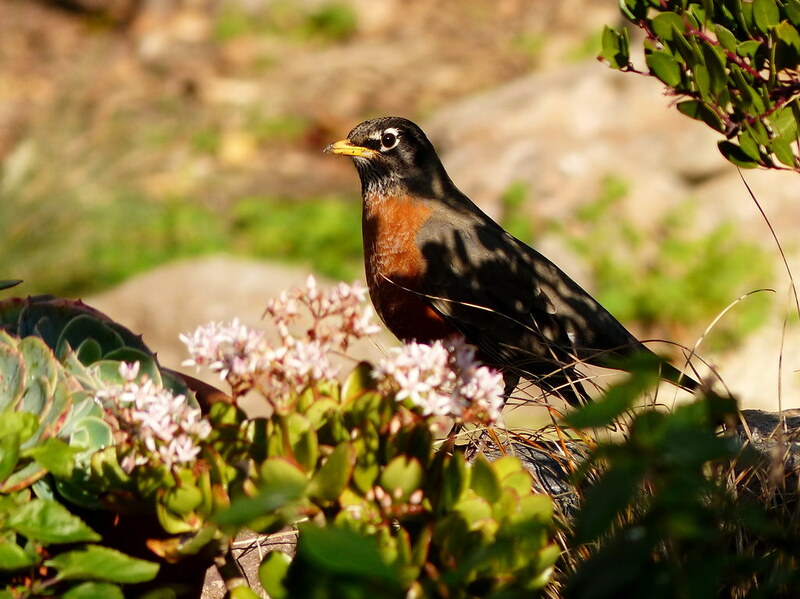 The American Robin is all over the place. We rarely see him in our lawn-deprived yard, but they’re around all the time now. We’re also seeing more Hermit Thrush than normal, and even a few Western Bluebirds have been seen in the neighborhood. I would very much like to encourage them to visit our backyard. All in all, a very nice showing by the Thrushes this year. We were having bird swarms around our house in Boise today. Mostly robins I think, but maybe thrushes.